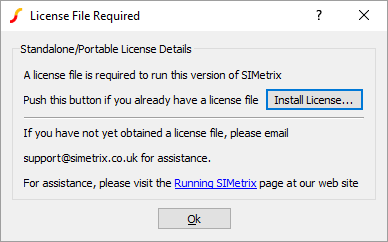 SIMetrix and SIMetrix/SIMPLIS must be started with administrator privilege when installing licenses. When SIMetrix and SIMetrix/SIMPLIS start for the first time, you will need to read and agree to the terms of the end-user license agreement (EULA), then provide information about the type of license being used and the location of the license. The program will automatically prompt you to do both of these and will not operate until both are complete. 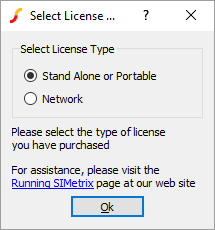 After accepting the EULA, the program will display the following window asking you to choose the type of license that will be used. Select the license type you have and press OK.
For portable licenses, first ensure that your USB dongle is connected to your PC. Next ensure that you have the license file we supplied by email, this file will end in .lic, and that this file is in a location on your local machine that will not be deleted. After selecting portable license from the previous window, the following window will be displayed. Press Install License... and give the location of the license file when asked. When the license file has been accepted, the program will then begin to operate. If the application does not find the plugged in USB dongle, you may need to download and install the dongle driver. For network licenses, you need to provide the location of the license server that SIMetrix and SIMetrix/SIMPLIS should use. 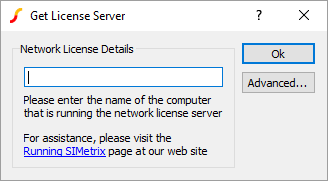 After selecting network license from the previous window, the following window will be displayed. Enter the host name of the machine running the server, or the machine's IP address. Press 'Close' and the program will attempt to check out the license from the server and if successful, SIMetrix or SIMetrix/SIMPLIS will start normally. If you need to specify port numbers to use to comply with your company firewall, view specifying ports.